Since Wednesday’s haiku for the candy-coated chocolates that melt in…well, you know, was so popular, I couldn’t help myself but make them the subject of this weeks’ debate. See, not only are M & M’s loved nearly universally, they also come in an abundance of varieties, which makes them a topic debate plum for the picking. When I was kid, I was strictly a Milk Chocolate fan. And, yes, somewhere buried deep in my psyche is the unshakeable knowledge that the green ones are somehow better than all the other colors, and may in fact, bestow upon those consuming them mage-like qualities. Such powers, however, oddly enough seemed to manifest themselves as something very similar to a sugar rush. I’m still not certain that I trust those new-fangled red and blue ones, since back in my day, there were no M & M’s of such color. Sure, non-toxic red and blue dyes may be available nowadays, but that doesn’t mean I have to trust ’em. I’m tellin’ ya, the red ones must be like red kryptonite or something. Seriously, no good can come of them. Anyway, as I’ve aged, of course, my tastes have changed. Nowadays, my personal preference tends to be the Dark Chocolate ones mixed evenly with Peanut (a mix evident in the photo should you choose to scrutinize it). Little did I know until writing this post that there are apparently even Dark Chocolate Peanut M & M’s somewhere in the world. Finding those is about to become a new compulsion for me, right up there with find the perfectly balance pale ale and selling my novel. M & M’s: Plain, Peanut, Peanut Butter, Milk Chocolate, Dark Chocolate, or God-forbid, Coconut or Almond? What’s the best? I expect only fully explained positions in this debate, of course, as usual. Have a great, possibly candy-coated weekend! Next ›Well, THAT was easy! 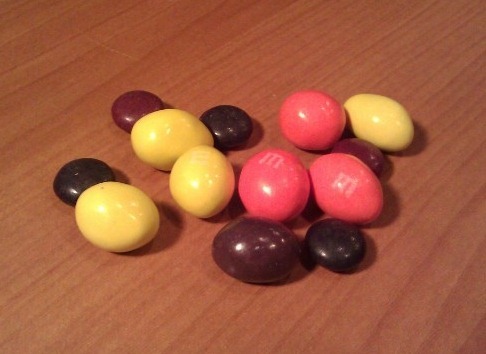 M&M’s are awesome…peanut/pretzel M&M’s are even better. Hey I think you might like the very non-toxic “Unreal” brand of M&M type candies, because they have a bit of a dark chocolate taste to them. They also make Snickers, Reese’s PB cups, and Milky way copies, but all of their products are free of petroleum dyes, petroleum preservatives, GMOs, corn syrup, and hydrogenated oils. You can find them in CVS, Walgreen’s, Kroger grocery, and even Michael’s craft stores. Target and other groceries will carry them very soon. We’ll be giving these to our kid for our Halloween “trade deal”, where she trades the standard trick or treat stash with petroleum, for some safer replacements. See http://getunreal.com for more info. Lots of good options at NaturalCandyStore.com and IndieCandy.com too.